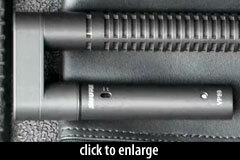 The VP89M is a medium length professional shotgun microphone. It is part of the modular VP89 series, consisting of the VP89 preamplifier body (official part number RPM89/PRE) plus the RPM89M capsule head. Like the other VP89 components, the VP89M uses a perforated interference tube made of aircraft-grade aluminum, housed within the aluminum grille. The electret capsule is mounted toward the rear of this assembly. The capsule is tested to survive a 12-foot drop. The VP89M has a 50 degree acceptance angle. The high frequency response above 10kHz is improved compared to the VP89S. The VP89M includes the VP89 head amplifier (p/n RPM89/PRE), the medium-length capsule head (p/n RPM89M), a foam windscreen (p/n A89MW), and a cylindrical storage case (p/n A89MC). 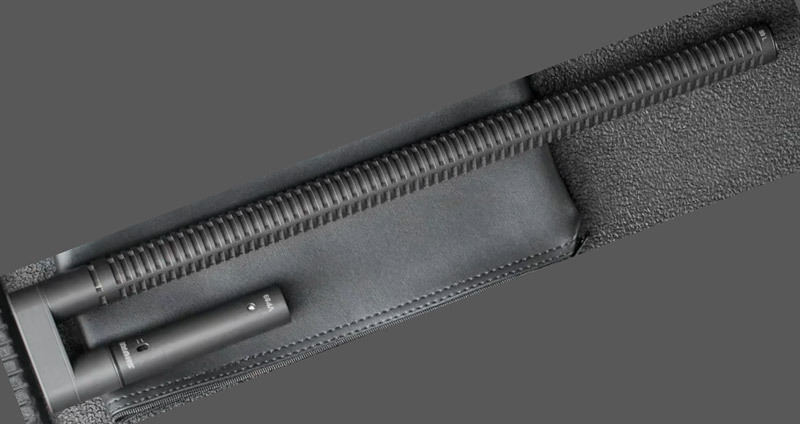 Optional accessories include Shure’s unique U-shaped “double-barrel adapter,” (p/n A89U) which allows the long capsule head to be mounted parallel to the head amplifier, reducing the overall length of the assembly. Numerous additional shockmount and windscreen accessories are available for the VP89 series shotguns, from Rycote. The mic was released in 2011.